Nothing connects me more to the emotional core of a film than a child. Nothing. As far back as I can remember I have been a man who has no qualms expressing my empathy and compassion for humanity, both those suffering in reality and the characters born of fiction. I was and continue to be easily moved by the plight of people, but ever since my daughter was born eight years ago I find myself more and more shaken by the combination of tragedy and youth. My stomach hurts. I feel nauseous. The tears well up in my eyes. Even knowing full well that what I am witnessing on the screen in front of me is merely actors acting, I find myself thinking of all the terrible things that happen to children all across this world and there are no cameras there filming. No director yells cut. These feelings, they linger for days, sometimes weeks. Honestly, I still haven't been able to shed the weight of the cinematic experience that is Alfonso Cuaron's Gravity, but with that film I don't want it to go away. I was so moved and inspired by the metaphorical journey of a woman attempting to transcend and move past horrific grief that the stomach pain, the nausea, and the tears are all welcome and feel soothing, healthy and important. Not all pain is equal. My stomach hurts. I feel nauseous. The tears welled up in my eyes, but I want this feeling to go away. I want to stop picturing the look in his eyes when he realizes all hope is lost, when he realizes that her lifelessness isn't temporary but rather permanent. I want to stop seeing the vibrancy of the color red and thinking of the coldness of death rather than the fiery warmth of life. I don't want it anymore, but the power of outstanding cinema is that even when it doesn't feel soothing or healthy, it still can feel important if only because of the admiration of the craft. I don't want to think about the dangers of the world around me and the fragility of life while looking at the beautiful girl who is both my best friend and the love of my life. I want to believe in happiness and normalcy and that each day will merely seamlessly blend into the next and the one after that without any chance of it ending. 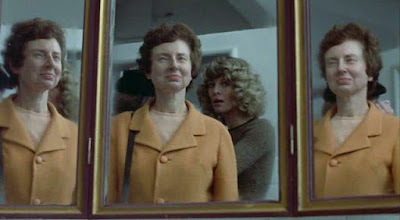 I can't though because I can't stop picturing the look in his eyes, and this is all just from the first few minutes of the film Don't Look Now by Nicolas Roeg. Despite the fact that the vast majority of the picture went beyond the opening tragic sequence, when my absolute biggest fear plays out on celluloid it's not easy to analyze what follows. I tried my best though because the work of Roeg deserves that much, and the man films and frames this movie with a brilliant touch. Making an entire movie work isn't a one man show, and everything on display here from the stirring, jarring performances to the unnerving score to the photography that produced such chilling imagery, it's all so damn great. What I found fascinating about the first half or so of the picture is the way grief is portrayed through different people both suffering and trying to cope but in vastly different ways. 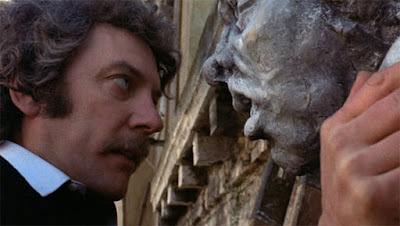 John (Donald Sutherland) is taking part in the restoration of a church and perhaps being surrounded by the religious symbols or maybe just the comfort many find inside those walls helps him deal with the horrific loss. 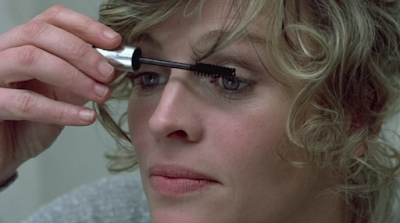 Laura (Julie Christie) relies on a level of numbness and calm that can only be achieved through medicinal options to maintain an emotional balance and sanity until one day she encounters two older sisters, one of which claims to have the ability to communicate with the dead and has seen their deceased daughter. Laura has not been this happy and content in a long, long time because she wants to believe in the unbelievable because it provides comfort and hope and it opens a realm of possibilities that makes the concept of mortality something that should not be feared. Her little girl was gone but never forgotten. Perhaps she is not even actually gone? John doesn't buy it. He perceives their spiritual communication as nonsense and he isn't willing to open his mind and find peace the way Laura has found it. He is a pessimist but also a realist, and his acceptance of logical truths helps him move forward rather than look back and experience that awful day all over again. What feels like a story of a marriage trying to survive a tragedy, the type of loss that can often times split up two people who previously felt a deep and profound love for each other, ends up becoming a very eerie, supernatural tale that finds new ways to haunt and fascinate beyond those opening minutes. Those damn opening minutes. Don't Look Now is a powerful, strange and frankly upsetting piece of cinema that allows me to officially declare myself a fan of Nicolas Roeg. I previously has only seen his film Walkabout and goodness it is terrific, but one special experience hardly cements a fan of a man behind the lens. Throw in a second, equally as confident and powerful work and I can safely say that Roeg had a special eye for top notch filmmaking. I want to forget that look in his eyes yet I don't. I want him to save her before the water fills her lungs but he won't. I just want such moments to only live through a fictional narrative. When I look at my daughter I see the beauty in this world and much like Laura, I believe in miracles. When his eyes and the devastation in them come flooding back to me, it hurts. It really hurts. 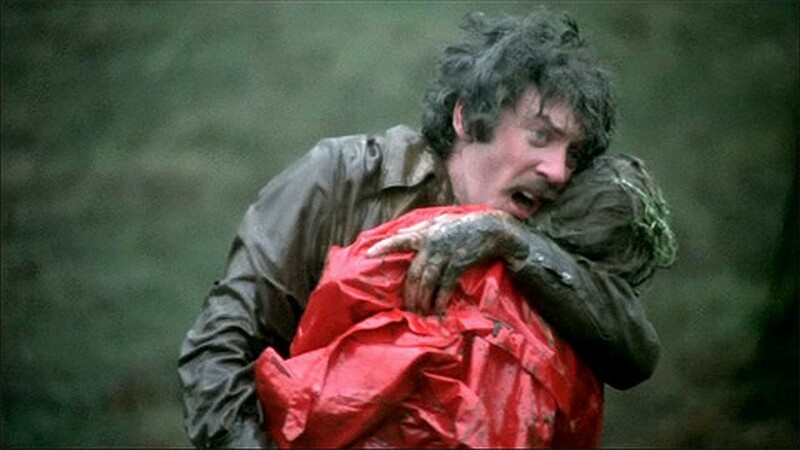 Don't Look Now hurts, but it's impressive and important. I suppose I am okay with the pain. Yeah, I don't remember it too deeply and it's been a while since I saw it, but all I really remember is being very terribly bored. I looked up my rating in IMDB and it was 3/10. haha wow we had a very different experience with this one, haha. It happens, I have been bored by plenty of films others love. I am obviously the minority in this respect. On IMDB, 74% of voters gave it a 7/10 or better. Maybe if I watched it again I would see something I didn't remember.